Many personal injury victims are scared to contact a bodily harm claim insurance settlement lawyer . One of the big reasons is that they are afraid they will get taken by the lawyer. They are between a rock and a hard place as big insurance wants to delay , defend and deny so they pay you a pittance. So Anthony Castelli, a personal injury in his own right with 32 years experience, wrote a book to help injury victims find the very best lawyer for the redress of their harms and losses. There are three ways to look at this book written by +Anthony Castelli. One – From a lawyers perspective, it will give you the criteria for becoming a great personal injury attorney. Two – From a client perspective, it will give you the criteria you need to hire a great personal injury attorney. Three – From Vin Messinas perspective, or anyone doing marketing for attorneys, it will give you most of what you need to understand how attorneys develop business. Anthony wrote the book, seemingly for one reason, to help people who need a personal injury attorney, find a good one. He meets this purpose head on by first talking about the marketing side of the legal profession, helping people understand how it works, and how to decipher the good from the bad. From a lawyers point of view, this could serve as a summary manifesto of how to conduct yourself and become among the best of your profession. From a marketers point of view, Anthony sums it all up rather nicely when he says, create marketing and advertising that EDUCATES. In essence, he is telling us to help our clients be useful. This is a great read. It is also a quick read. The book drives home the message using only the words necessary to do so. It is not long winded, and gets straight to it. 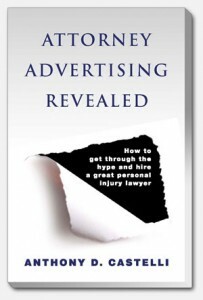 If you are a lawyer, a marketer or a person who has just been injured in a car crash…LOL…I suggest you read this book. This link below takes you to more reviews about the book on google book review.